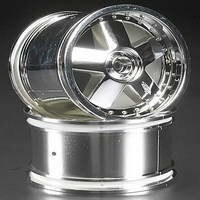 This is a pair of Chrome GT 5 Wheels for the HPI Savage 21 Truck. FEATURES: For the HPI Savage 21 RTR truck (HPIC1831). 5-spoke design with embossed HPI logo.